Frogs are delightful creatures. They come from adorable tadpoles hatched from eggs, utilize their powerful tongues to catch prey, and croak to their hearts' content. In fact, frogs are so cool that xUmp has adopted the Red-Eyed Tree Frog as our mascot! BUT... you've never seen a frog do anything like this! When cranked using the knob on his side, this wind-up frog crouches on its hind legs, and leans slowly forward, preparing for coming leap. 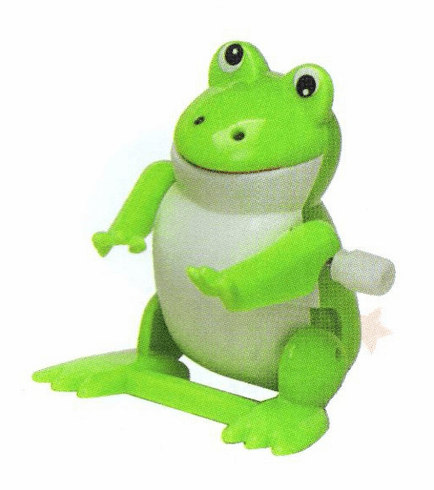 When he's leaned far enough forward, the frog lets loose with an impressive back-flip, landed right back on his feet! Then he leans over to do it all again! Makes for an excellent gift for kids or a fun desk toy.